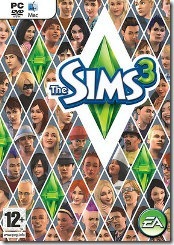 Actually, I’m not playing The Sims 3 myself – it isn’t really on my list just now – but apparently a whole bunch of you are, having downloaded the bootleg copy online, from wherever. That in itself isn’t so surprising, considering that apparently it’s being downloaded even more than Spore was if the stats are credible. What’s interesting, is that every single one of you that’s mentioned to me that you’re playing the bootleg have already preordered the game and are just waiting for it to come in. Now that’s an interesting, if slightly unscientific statistic. And yes, I have it pre-ordered. And prepaid. My guess is that a large majority of ‘early adopters’ will actually purchase the game for the extra content and patches anyhow and, like myself, simply couldn’t pass up an opportunity to take it for a test drive two weeks before it hit retail. That’s not quite true. The ‘missing’ content is a free town you get when registering the game; none of the stock features are missing or non-working, and the version reported upon loading is ‘Retail Branch xxyyzz’, which makes sense as it was likely leaked from the CD manufacturing plant. If CD’s are already sitting in the back rooms of stores here in Australia right now, the release code would’ve had to have been finished by 2 weeks ago. Having said all that, what else could EA possibly say in a statement regarding the issue. And no matter what, it *is* piracy, which I like to pride myself upon avoiding normally. I guess it begs the question: As I’ve literally already paid for the product, am I ‘guilty’? Definitely a weird one, but somehow any guilt is equalised by my purchase, in my mind. Now if only I could stop playing it – should really be doing the dishes and the washing.. just one more ingame day then I’ll stop..